Alexander: "It's like I was born an old man." Nurse: "Don't worry. You look great for forty." I was very impressed with the power of the story, the beauty of the photography, and the strength of Roy's performance. 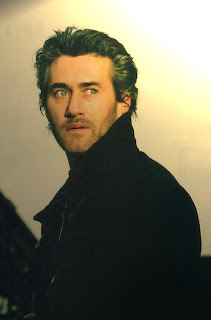 Roy Dupuis plays Alexander Tourneur, a veterinarian who is in a hit and run accident. Alexander wakes up unexpectedly from a coma when his life support is turned off, and has no memory of his former life. As Alexander slowly recovers physically and interacts with his wife, daughter, and friends, none of whom he remembers, he sorts through confusing flashes of memory as well as contradictory accounts of his past relationships. What I found fascinating was that Alexander's perceptions appear to ricochet and affect the memories of others; his amnesia is apparently catching. (This is fairly subtle at first.) His only "unaffected" conversations are with the police who are investigating the hit-and-run as well as the attempt on his life. Early on, one of the cops says, "He looks like he needed an extra week in intensive care." Alexander does look gray and drawn (actually, pretty terrible) at the start of the film, and Alexander's mental and physical state is reflected in the photography. It is winter; the color is muted and much of the background is gray. Roy's performance goes from subdued and exhausted to deeply emotional as Alexander discovers the truth about himself, and as the story progresses, the color in the film increases in intensity along with Alexander. The photography is just stunning. Many of the images are very powerful and quite beautiful. Much of this film can be interpreted in more than one way, but this is not one of those abstract movies where you get to the end and you don't know what happened. The resolution is moving and everything pretty much makes sense. I recommend watching it twice; the second time, for me, was like watching tumblers click into place, and I found even more layers of meaning and depth in what was happening. I enjoyed so much this movie! The emotional range of the characters is wide and great. The intensity in father and daughter, the mild care of the police officer... the detached attitude of the wife's lover. As you said, colors -and light I would add- go with his 'moments', from almost grey and white -full of shadows- to full color and light at the final scene, the erasing wall scene, that shot is so good.